Inspired by educational theorists Howard Gardner and Maria Montessori, our Mindfulness & Movement for Kids Foundations Training takes a whole-child approach — and integrates math, science, literacy, art, music and more. The approach is fun, empowering and fully capable of reaching students of all ages and abilities. Whether your aim is to become a kids yoga teacher — or to get new tools for integrating yoga into a child-friendly environment (classroom, home, office) — our Foundations Training is the place to begin. This event, held in areas around the world, introduces attendees to the YogaKids’ one-of-a-kind way of teaching mindfulness and movement to children. The program is more than just poses. It blends traditional yoga and its benefits with theories of multiple learning styles in a comprehensive, imaginative, and playful approach to education. This revolutionary approach, developed by YogaKids founder, yoga-pioneer/ educator/author Marsha Wenig, has been helping children — along with adults — discover the pleasures and benefits of yoga for over 20 years. You will experience 2 full days of life-changing love and laughter, led by our YogaKids Teacher Trainer Tammy Semple. You will be introduced to all 14 of the YogaKids Elements, the building blocks of this amazing program. These Elements (Math Medley, Laughing Language, Visual Vignettes… to name just a few) incorporate all the different ways children learn. They combine yoga with reading, writing, science, art, music, games, ecology, philosophy and much more — and thus, create a matrix for learning that’s accessible to all children. You also will be introduced to the 20 categories of YogaKids poses/activities. The YogaKids program has over 185 poses/activities and the Foundations Training teaches 85 of them. (The others can be learned by joining the Certification track.) Some poses are based on traditional yoga asanas, while many are unique to the YogaKids program. 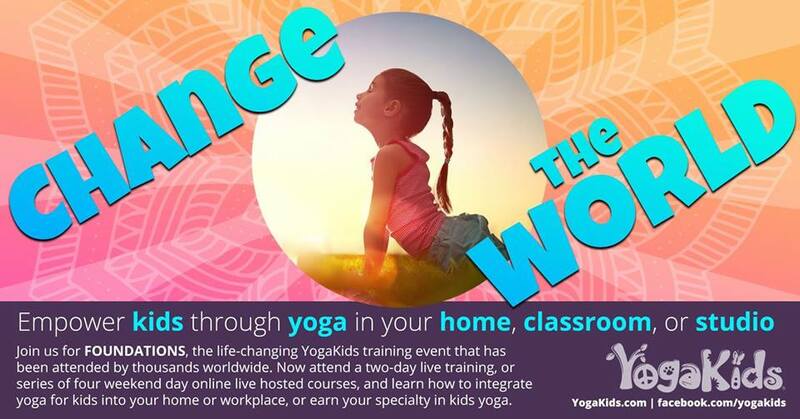 In addition, attendees will learn successful strategies for lesson planning an original YogaKids class. Other topics covered during the workshop include the different developmental stages of children, inclusive teaching, and guidelines for teaching a successful YogaKids class. Foundations Training events are for anyone wanting to give the gift of mindfulness and movement to children: educators, parents, occupational therapists, speech therapists, yoga teachers, and other child-focused professionals. No yoga experience is required. Our program has been endorsed by Dr. Deepak Chopra, Dr. Andrew Weil, and Jean Houston, Ph.D. It is the original training program of its kind.